The AMX-10P Marines was developed as a private venture by Nexter Systems (previously Giat Industries) Roanne facility specifically for the export market for use by marines and other armed forces having an amphibious capability. The first customer was Indonesia, which placed an order for 34 vehicles in two versions, 24 fitted with the Nexter Systems one-man turret armed with a .50 (12.7 mm) M2 HB machine gun and 10 fitted with the Nexter Systems TS 90 two-man turret armed with a 90 mm F4 gun and 7.62 mm coaxial machine gun. This turret is also installed on a number of other armoured vehicles including the Panhard ERC Sagaie (6 × 6) and Renault Trucks Defense VBC 90 (6 × 6) armoured cars. 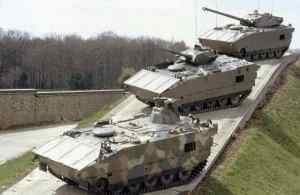 Singapore ordered a total of 44 vehicles in two configurations, 22 with the Nexter Systems TS 90 two-man turret (PAC 90) and 22 with the Nexter Systems Dragar one-man turret armed with a 25 mm M811 cannon and 7.62 mm coaxial machine gun (P 25 ICV). Singapore took delivery of 24 units in 1993 and 20 units in 1994. The AMX-10P Marines is based on the standard AMX-10P infantry fighting vehicle of which over 1,800 were built for the home and export markets but has improved amphibious characteristics. The AMX-10P Marines has been designed to operate in fresh water (river) or salt water (sea) without limitation of depth at a maximum speed of 10 km/h. The vehicle can embark or disembark from LCTs or LSTs without assistance and if required can use its main weapon whilst still afloat. Production of the AMX-10P series vehicles has been completed by Nexter Systems and they are no longer being marketed. The French Army is upgrading part of its AMX-10P vehicles to extend their lives. The overall layout of the AMX-10P Marines is identical to the standard AMX-10P infantry combat vehicle covered in detail in a separate entry. The main differences are its modifications to give it an improved amphibious capability and a wide range of weapon systems can be fitted.